PhD candidate Martín Fuchs gave an invited talk at El Colegio de México’s Center for Linguistic and Literary Studies as part of its Semantics and Syntax Seminar. Martín spoke about his dissertation work on semantic change in Spanish. In many languages, verbs can take on various shades of meaning. In the sentence Juan is eating spicy food, the verb is eating has a progressive meaning: the speaker utters the sentence while Juan is still in the process of eating. On the other hand, in the sentence Juan eats spicy food, the verb eats has an imperfective or habitual meaning. In this case, the speaker is saying that Juan likes spicy food, but Juan is not necessarily eating spicy food at the moment. English Present Progressive (Progressive): Juan is eating spicy food. English Simple Present (Imperfective): Juan eats spicy food. In English, we can tell whether a present-tense verb expresses progressive or imperfective meaning by examining its form. When the verb is in present progressive form, characterized by the -ing suffix, the verb expresses a progressive meaning. When the verb is in simple present form, it expresses an imperfective meaning. Martín’s research focuses on a phenomenon called progressive to imperfective shift. The progressive to imperfective shift is a trend observed in many languages in which verbs in progressive form tend to take on imperfective meanings over time. This process typically occurs in three steps. Recruitment: When the language uses the same verb form to express both progressive and imperfective meanings, a new verb form emerges that only expresses progressive meanings. Categorization: The old verb form no longer expresses progressive meanings, and instead only expresses imperfective meanings. The new verb form continues to express only progressive meanings. Generalization: The new verb form begins to express imperfective meanings as well as progressive meanings. Martín believes that the Spanish present progressive form, shown below, is undergoing this process. In the past, both progressive and imperfective meanings were expressed using the simple present form. The emergence of the present progressive form represents the recruitment step in Spanish. According to Martín’s previous research, Spanish speakers generally prefer the present progressive over the simple present for progressive meanings. Speakers in Spain and Argentina still allow the simple present for progressive meanings in certain contexts, but speakers in Mexico do not allow the simple present to express a progressive meaning in any context. This suggests that the categorization step is underway in Spanish, and it has progressed farther in Mexico than in Spain or Argentina. To better understand the various nuances of progressive and imperfective verbs, Martín is currently conducting research in Mexico as a visiting student at El Colegio de México, where Martín gave his talk. Martín will later travel to Spain and Argentina to study the varieties of Spanish spoken there. 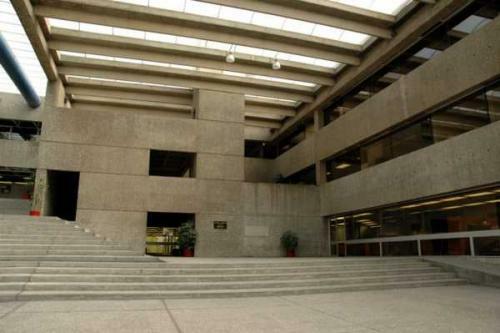 Martín’s talk, entitled Synchronic variation and semantic change in the Spanish imperfective aspect: categorialization and generalization (Variación sincrónica y cambio semántico en el aspecto imperfecto del español: de la categoricalización a la generalización), was given at El Colegio de México’s campus in Mexico City, Mexico, on September 10. Information about the talk (in Spanish) is available on El Colegio de México’s website.